Description: Caespitose perennial to 1.5 m high, with conspicuously extravaginal shoots from a short rhizome. Leaves with ligule leathery, truncate or occasionally slightly obtuse, glabrous or ciliolate, 0.4–1.5 mm long; auricles slightly thickened; blade tightly rolled or expanded, to 4 mm wide, scarcely to densely pubescent to glabrous, ribbed on upper surface. Panicle exserted, loosely contracted to spreading, sparse, to 30 cm long. Spikelets gaping widely, 15–24 mm long. 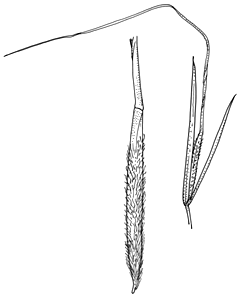 Glumes unequal, narrow-truncate to slightly acute. Lemma 9.5–15 mm long, finely tuberculate, especially upwards, with sparse slightly reddish brown hairs below, reddish brown at maturity; coma and lobes absent. Callus weakly bent with slightly reddish brown hairs. Awn twice bent, 6–10 cm long. Palea 50–70% the length of the lemma. 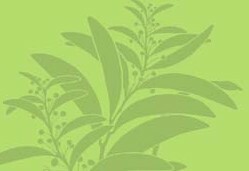 Distribution and occurrence: Grows in woodland and heath in sandstone areas.